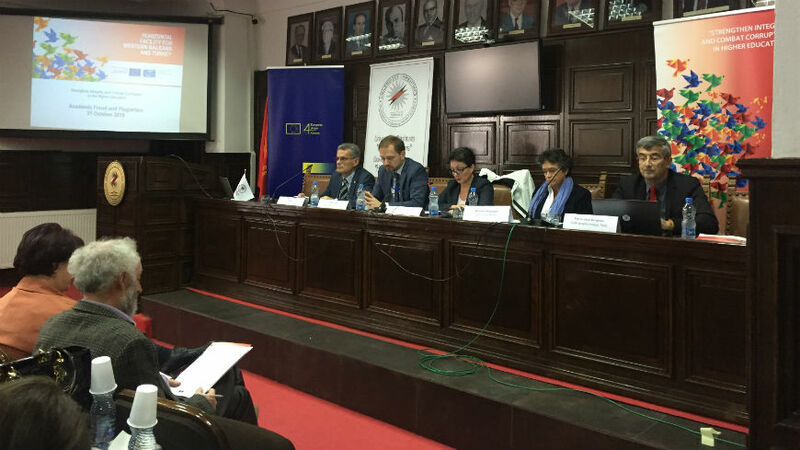 A seminar on academic fraud and plagiarism was organised in cooperation with the University of Pristina and the International Institute for Research and Action on Academic Fraud and Plagiarism (IRAFPA) on 31 October 2018 in Pristina. The event was attended by over forty academic staff, senior university managers and students. The participants had the opportunity to learn about the ways to detect plagiarism and address cases of academic misconduct from IRAFPA representatives, a leading European ethics and anti-plagiarism educational centre affiliated to Geneva University. In addition, the participants used this occasion to discuss and share their views and concerns about the current state of affairs in the Kosovo* higher education system. The opening speeches were delivered by Ms Isabelle Servoz-Gallucci, the Head of the Council of Europe Office in Pristina, Mr Libor Chlad, Deputy Head of Cooperation, European Union Office in Kosovo, and Prof Dr Marjan Dema, Rector of the University of Pristina. Prof Dema also gave an overview of the University of Pristina, its functioning, study fields, achievements and challenges. The seminar was organised within the framework of the Action “Strengthen Integrity and Combat Corruption in Higher Education” as the final event of the project. This action is implemented in Kosovo within the framework of “Horizontal Facility for Western Balkans and Turkey”, jointly funded by the European Union and the Council of Europe and implemented by the Council of Europe.